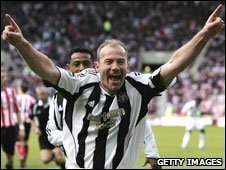 Alan Shearer is set to take to the pitch at St James' Park one more time. The Newcastle United legend is the latest football star to sign up for a one-off match to raise funds for Sir Bobby Robson's cancer charity. Sunday's game pits some players from Sir Bobby's Italia '90 squad and other stars against a German side captained by World Cup winner Lothar Matthaus. The County Durham-born, former England and Newcastle manager is battling the disease for the fifth time. Alan Shearer said: "Bobby really deserves this match after everything he's done. "I feel I owe him a personal debt. When he came in as Newcastle manager he got me enjoying football again and playing the way I can. "He helped me when I needed it and I'm very happy to help him now. "This is essentially a very well-deserved testimonial game for Bobby and I hope the night is as special for him as my final game playing for Newcastle was for me." Sir Bobby said: "I'm very grateful to Alan for playing in my game on Sunday. "The German defence will be getting more and more worried won't they? "Alan Shearer, Peter Beardsley, Paul Gascoigne, Les Ferdinand, we've got plenty of goal scoring options with that line up."